In early February, my wife, Emily, and I drove from Lyme, NH, to Terra Alta, WV, to pick up the newest member of our family, an English setter puppy named Rode (pronounced ROW-dee, named after an Italian ski wax company and also short for Rodeo, since Emily is from a Wyoming ranch family and the pup bucked and spun like a Brahma bull). Our older dog, Birch, came from the same breeder about 10 years earlier, and is Rode’s great-uncle. Birch joined us on the road trip to reconnect with his long-lost Appalachian kinfolk, though he didn’t show any sign of recognition. We left West Virginia early on Sunday morning and arrived back in the Upper Valley late that night. Like all puppies, Rode was a terror in the house. He peed on the hardwood floors, he pooped on the Oriental rug, he chewed antique furniture, he shredded paper in the recycling bin. He barked, he whined, he howled. Birch was not happy about sharing his home with a puppy, and in the early weeks, we had to keep them physically separated at all times; Birch only succeeded in drawing Rode’s blood twice. Emily and I were stressed and frustrated. Tears were shed (not Rode’s, as he could not have cared less about how we were feeling). We hunt upland birds with Birch, and plan to hunt with Rode, too, so we started getting Rode out in the woods on his very first day. The snow was deep, so we stuck to well-packed trails at Pine Park in Hanover, Boston Lot in Lebanon, and around Huntley Meadow in Norwich. We quickly realized that taking the dogs out on the trails provided the respite we needed. Off leash, Birch and Rode ran around and got along beautifully. They tired themselves out. Rode came when called, could not destroy any of our property, and didn’t bother anyone with his barking. I have always been an enthusiastic trail user (hence my position on the UVTA board), but I was becoming obsessed, often taking the dogs for off-leash trail walks three times a day. The more I walked Rode, the more I came to see the joy of raising a puppy, and the chaos in the house felt more like a minor nuisance than a cause for serious stress. In short, trails made everyone happier. Emily and I are expecting our first child in June; Rode will be six months old when the human puppy arrives. We also just bought a new house, which backs directly onto a large Town of Hanover conservation property heavily laced with trails. We chose this house deliberately, knowing how important it is to have easy access to the outdoors. This summer, yet another addition to our family will join us on the trails, and I have no doubt that each walk will reduce our collective stress and bring us closer as a family. We just hope the baby won’t have an appetite for gnawing antique furniture. make new friends amidst our journeys, and feel good. education among children have been cut continuously over the past three decades. lifestyle. This barrier is common, and in my opinion, surmountable. activity among children and adults. energy levels, and eventually forget those old, negative, physical activity experiences. to connecting people and promoting positive physical activity experiences. resource for positive New Year’s resolutions. Back in July, Jonathan Frishtick wrote about a couple of his favorite web sites, both oriented around mapping. This month, I’ll be furthering the conversation about how trails cross with technology by discussing trail oriented smart phone apps, which are practically like having a GPS unit on steroids. Before I get too far, I should mention that I’m a computer tech by profession but only succumbed to the smart phone mania last spring in anticipation of a trip overseas. Six months in and I must admit I’m sold. While I was away I used it extensively to find food, lodging, and especially information on the parks and recreational areas where I was traveling. Now, I’m not the type who responds to every email, text or call immediately, and there’s no compulsion in my bones to be constantly connected, but I do love the way I can use my phone for navigation and information gathering. To get started I’ll put in a shameless plug for our very own Trail Finder app. If you’re looking for trail information in our region, Trail Finder is the key that unlocks the door to all you need to know, so check it out. While Trail Finder includes a live tracker, it’s not a complete trail tool. To check out the Upper Valley Trail Finder and download the app, visit uvtrails.org. Read on for more on those. Technology has advanced to the point where your phone is a highly accurate GPS device which, when combined with good software design, means you can plan and track routes right on your phone. Even when there’s no cell signal, you can often download maps in advance and some apps will utilize the accelerometer and compass to keep tracking your location. Your phone will continue to work as a GPS without cell service, but it will be much slower. So, now that you have a GPS on your phone, what can you do with it? When considering trail apps, here are the basic features that almost everyone wants: ~route tracking utility, detailed speed and/or pace, and time, distance, and elevation tracking. These are almost universally provided in any app you might use, but with varying accuracy and ease of use. Most people want a fairly decent underlying map with good detail and contours, and the ability to upload and store routes. In order to accomplish the latter, most of the apps expect the user to create an account on-line which is updated either automatically or when the user chooses, depending on settings. In that regard, Google gets a leg up on the competition with their Google’s My Tracks for Android, which ties to your existing Google account (assuming you have one), meaning there’s one less user ID and password to think about. One more common feature is the ability to set automatic and/or manual waypoints. For many, sharing through social networks is also important and has the added advantage for the developer to get a little free promotion. Take note of whether an app includes link to the major social networks like Twitter and Facebook, or if shared data is housed on their own site. That can limit the audience if your friends aren’t using the same app, but on the other hand, you may make new friends. Of course sharing these days usually means pictures, so an app that has a built in link to your camera is convenient for sharing images from the trail, and has the side benefit of being a great tool for trail maintainers who can utilize the geo-coded pictures for planning trail work. Many, if not most of the apps you’ll find will offer both a free and pay version. Typically, the free versions waste valuable screen space with advertising or omit a key feature to lure you into paying. With that said, it’s usually worthwhile to check out the free version first to make sure you like the interface. One of the first questions to ask is, “What information is important to me?” That should help you identify the features you want in your app. For example, are you interested in creating and sharing maps of the routes you’ve taken, or maybe just like to keep track of where you are in the woods? Perhaps you’re primarily concerned with tracking fitness goals. While many apps are rich with features, finding the one that suits your perspective is the trick. Sometimes, there are so many features that it’s difficult to actually use the tool effectively, so be cautious with the one size fits all apps. A perfect example on the iPhone is a compass. There’s a pretty nice one built right into the phone, so I generally don’t feel the need for one in the app. But that’s just me and you may like an integrated compass, or one with more features than the default provided with your phone. You might be wondering what app I use? I found Map My Hike to be a simple and straightforward app, but as a map enthusiast I found the underlying maps sorely lacking in detail. The audience for this app seems more oriented around fitness, because it includes tracking of heart rate and caloric consumption, for example. That’s not really my interest, so I kept coming back to the Trimble Outdoors Navigator. This well designed program offers all the basic features noted above with some nice perks. For example, you can choose from a range of base maps like USGS type contours, or aerial photos for example, and even download maps so you can use the app when you’re not in cell range. Route tracking is easy to setup with slick editing features for naming routes and waypoints. Sharing is via the Trimble Outdoors user site. In closing, I’ll note that relying on an electronic device as your sole means of navigation is folly. Batteries die at the worst possible moment; phones get wet and fail, etc. Carry a map and a regular compass when you go deep into the woods. Oh, and if you do bring your phone, please turn off the ringer…. Windsor isn’t the first place one tends to think of when discussing trails in the Upper Valley. But in and near are two of the nicer trail systems in the area, Paradise Park and Mt. Ascutney State Park. Paradise Park, in the center of town, isn’t really so much a place to hike as it is a place for a long, pleasant walk. You can take a saunter around Lake Runnemede, or a longer walk through the woods, or combine a woods walk with a walk through town. The park is a fun place to explore, and most trails are either loops, or pop out on a road somewhere in town. It’s the perfect place to bring children and dogs. My favorite walk, almost always accompanied by my faithful Corgi, begins on Route 5 just north of the downtown. Simply pull over to the right shoulder when you see the sign for Back Forty on your left. There are normally a number of cars parked here. The North Dike and Main Dike Trails begin on the left a short walk down the unpaved Eddie’s Place. Once on the trail, I usually turn to the left and follow it around the field to the gazebo by the lake. Lake Runnemede, also known as Everts Pond, is roughly horseshoe shaped. The trail follows the inside of the horseshoe. This area is popular with bird watchers. You can also see deer, beaver, muskrat and a variety of amphibians. If you happen to be in the field at the right time on a summer evening, you’re likely spot a few of Vermont’s now sadly rare Little Brown Bats making a feast of the mosquito population. Once back to the North Dike trail, I turn left down a short incline and across the dike. This is a short, but unique section of trail that skirts the shallow end of the lake on one side and giant cattails on the other. At the end of dike, the Windsor Town Forest begins and here I turn left once again and follow the woods road. In the past, I’ve turned after a short distance to follow the trail along the lake shore. However, with this summer’s heavy rains this trail has been boggy at best and occasionally impassable. So I stick to the road which leads up hill and ends in a large picnic area with an open-front shelter. From the shelter, I turn left yet again, although there are other trails which begin here and head back into the woods. At the edge of the picnic area, my route takes me down a steep trail to a small, gated road. Turning right this time, I follow the road up hill and through a neighborhood of older homes to State St. Turning left here, I follow State St. to left on Main St. and a walk through the center of Windsor back to my car. This is truly a place that creates and connects a community through the use of trails. 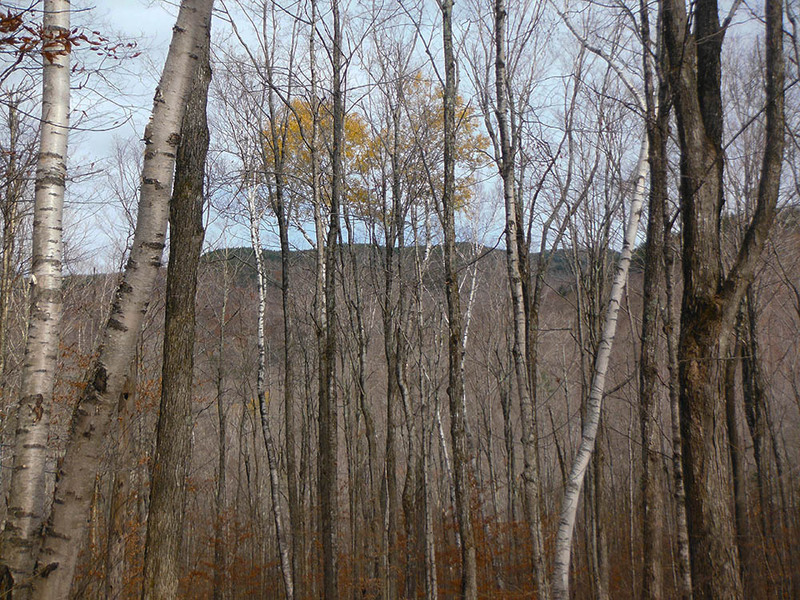 For the years when my kids were growing up, we thought of Ascutney as our “home mountain.” It was our first hike of the spring and one of our last of the fall. Ascutney is an ancient volcano. A big chunk of rock worn down by the receding glacier; it stands alone beside the Connecticut River. A look at Google Maps satellite view clearly shows the outline of a crater. At about 3,100 feet, it’s by no definition a giant. Nevertheless, the trails are steep and challenging, the views are excellent, if marred in one direction by an antenna farm, and the mountain is rich in history. On my last trip, with my daughter just a few weeks ago, we traveled up the Brownsville Trail and returned via the Windsor Trail. 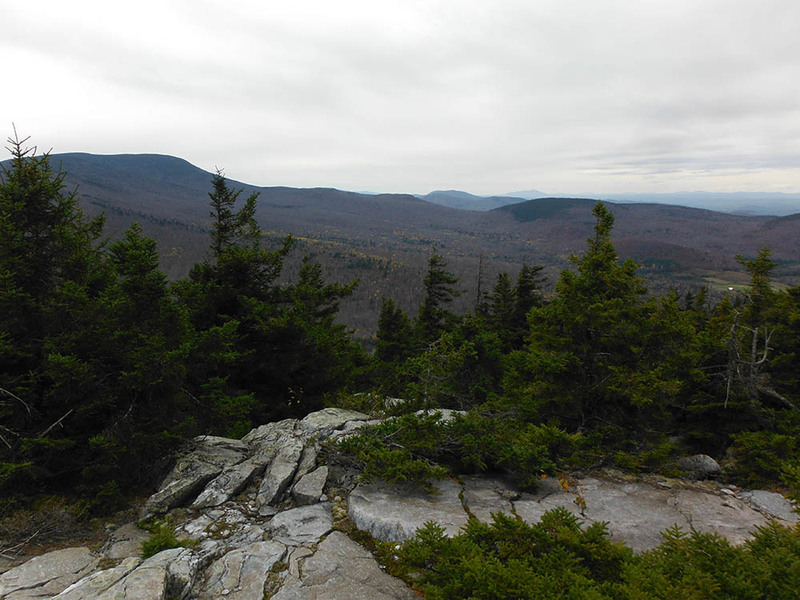 Neither of these are the most popular Ascutney hikes. The Weathersfield Trail, at the end of High Meadow Road off Route 131, with its cascades and lookouts wins that contest. The Futures Trail, which begins in the campground at Mount Ascutney State Park, is also very well-traveled. Although a very nice hike, it comes in close proximity to the toll road. From the center of Windsor, simply follow Route 5 (Main St.) to the lights at Union St. and turn right. Union St. becomes Route 44. Stay on 44 (Ascutney St.) out of town for a few miles to the junction with Route 44A (Back Mountain Rd.) From here, you can turn left on 44A and the parking area for the Windsor Trail is a hundred yards or so to on the right or you can continue on 44 a little less than a mile to the Brownsville Trailhead on the left. The Brownsville trail begins with a steep climb to an old narrow gauge railway, or “steam donkey” grade. A short time on this easy climb brings you to the remains of the Norcross Quarry and a very nice overlook. From here, the real climb begins. 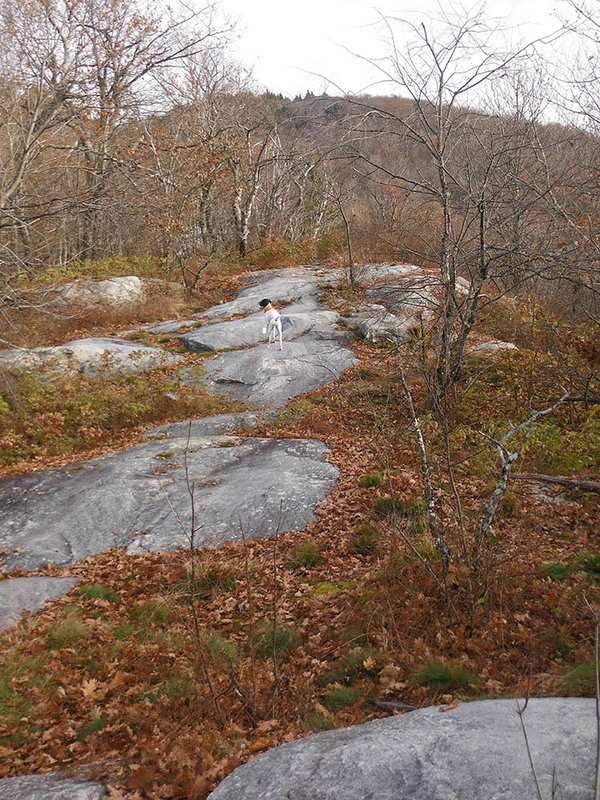 Leaving the quarry site, the trail takes you nearly straight up a steep, wooded ridge. 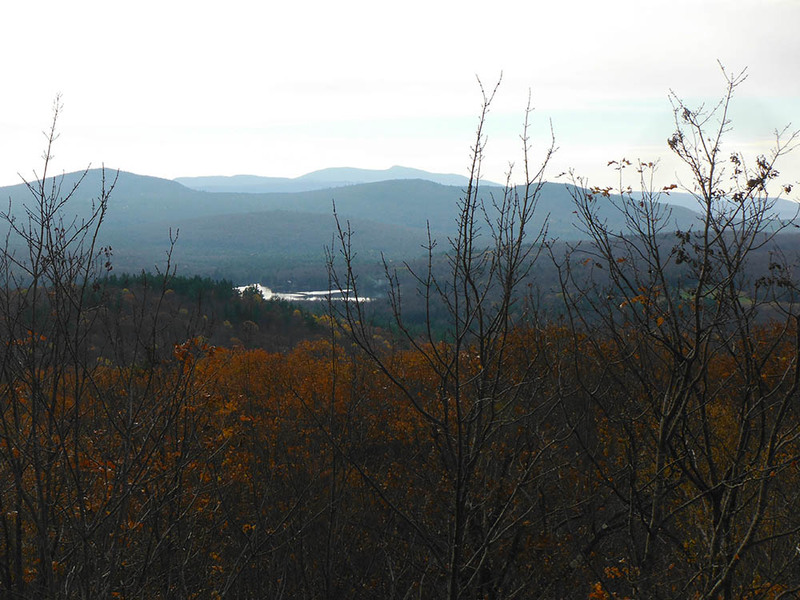 About three-quarters of a mile from Norcross is Knee Lookout, with a nice, but limited view. From here, the Brownsville trail continues its steep ascent to its junction with the Windsor Trail. I should note that both the Brownsville and the Windsor are blazed white, which can be a little confusing when arriving at this intersection. Once on the Windsor Trail, the uphill march continues via one of two routes, the short, steep older route, or the longer, but somewhat easier newer. My daughter and I choose the longer route, both to spare my battered knees, and to enjoy the view from the Hang Glider’s overlook. This route brings the hiker over the west peak and from there to the viewing platform—the remnants of an old fire tower—on the South Peak. The views from the top are as good as any in the region. The trip down begins by doubling back to the junction of the Brownsville and Windsor Trails. Once there, we continued down the only slightly less steep Windsor Trail, past a short side trail to a log shelter. There is a section of the Windsor Trail, below Blood Rock, that transverses a large granite sheet that usually has water running over it. Although there is a heavy rope strung between trees to use as a hand hold, this area is slippery and can be dangerous. I fell here several years ago while hiking alone, resulting in the aforementioned battering of one of those knees. On this latest trip, this section was as wet—and as treacherous–as I’ve ever seen it at any time of year. An example of how the increase in rain is affecting the land. One can only speculate what several season of this may result in. Our final stop on the way down was Gerry’s falls. This is a favorite, though now unusually buggy, spot to sit and enjoy the sound of the river. Again it’s running hard for this time of year, so be cautious. The falls are not high, and there are a number of places to take off your boots and soak your feet in the ice cold river. From the falls, it’s a moderately steep and very straight mile to the trail head on Route 44A. Taking a left out of the parking area, it’s about a mile of road walk to complete the loop back to the Brownsville parking area. Moving at a slow to moderate pace (knees again) and stopping to enjoy the views and the falls, the loop takes us between four and five hours, sometimes a little longer. It makes for a great day. I hope to see you out there sometime, with mud on our boots. Details information about these and other trails can be found at www.uvtrails.org. Click on the Trail Finder link.